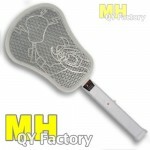 Bug Zapping Rackets | SkyLanterns, Hanging Lanterns, CandleBags. Ideal for High End Department Stores, Sporting Chains, Grocery Stores, Petro Stations, RV dealers, anywhere that quality merchandise is a must. 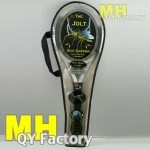 Has sold very well beside the inexpensive 1,000V ~ 1,500V zapper models at twice the price. Reasonable Mark-On Exceptional End User Value. Sold under many brand names in many languages! High Performance Circuit delivers the zap needed. Superior Components mean it works for a long time. Sturdy Construction for inevitable abuse. Time Tested electronics : 3300V at 0.03Ma to deliver a powerful zap. The only model with a sound bit in it. Great for camping, barbeque, the deck etc. If you are an importer or retailer looking for an item to create some positive word of mouth about your business, this is it. Cheering Bug Zapper Just zap the bug listen to the racket to cheer. Built in speake.. 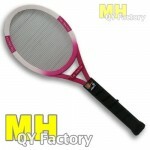 Heavy Duty/High Power hand-held bug zapping racket. A tool, not a toy. 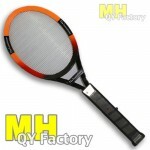 ABS plastic (not..
Just zap the bug listen to the racket to cheer. Built in speaker and Integrated circuit..